This is an aberration from what has been a trying couple of weeks. Not that the Dexcom has been failing me or anything. (In fact, I've been really impressed with its accuracy and ease of use. It totally crushes my experience with the Minimed CGM!) Just that everything else has. I don't know that I've woken up with a BG below 150 since the month began. 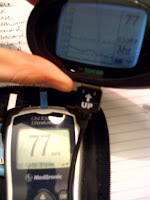 My 14-day average from my OneTouch UltraLink is 147, and my Dexcom graphs look like freakish craggy mountains. I know I've got to get a handle on things, but I'm not 100% sure where to start...and my March 15th appointments with endo and ophthalmologist are totally (guilt-inducingly) looming. I started on iron supplements AND reduced my Synthroid dose right around the same time this all started. I don't know that those two things have diddly-squat to do with this change, but I can't for the life of me think of what else it could be. My basals were pretty much figured out by the end of October and haven't required any real changes - now all of a sudden, everything seems to have gone haywire. Tonight I plan to: download all the Dexcom info I can; study all the graphs for some patterns; try to have a green bean dinner with minimal carbs as early as possible; basal test. I'm sick to death of waking up and feeling like crap, and then wrestling my BG to the ground until noon every day!